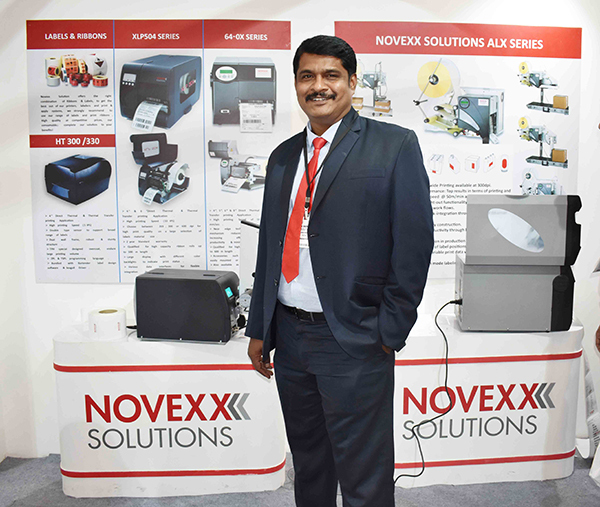 At Labelexpo India 2018, Novexx Solutions showcased live demo sessions of its print and apply machines, round bottle labeling machine, and print and apply machines. The company also displayed its blow on labeling machine which is basically for delicate products like fruits or vegetables. “In this application, the label is applied on the packaging through blown air, hence eliminating the need for physical contact,” said Sajan Abraham, general manager – South Asia, Novexx Solutions. The company also displayed its LTSI applicator – launched a few months ago – at the exhibition. The applicator is basically for applying primary and tertiary labels on boxes. “The advantage of this applicator is that it can be used on standalone position, and work with a pneumatic arm, and directly applies labels on products,” said Abraham. Abraham shared that Novexx’s journey in India has been very good with a double digit growth. “Our strategy is to make companies and our partners aware about the different types of automation that we can offer, and how it can help them run their production 24 x 7. People are expecting automation. Automation and packaging are two big things that are growing in India. If you see the growth of automation and packaging in India, it is growing at a range of 22 to 24%,” concluded Abraham.